An Animated Chat With 'Up' Director Pete Docter Up, the smash-hit animated adventure about a grouchy elderly man, a chubby scout, a 13-foot bird and a house borne aloft by balloons, is now out on DVD. 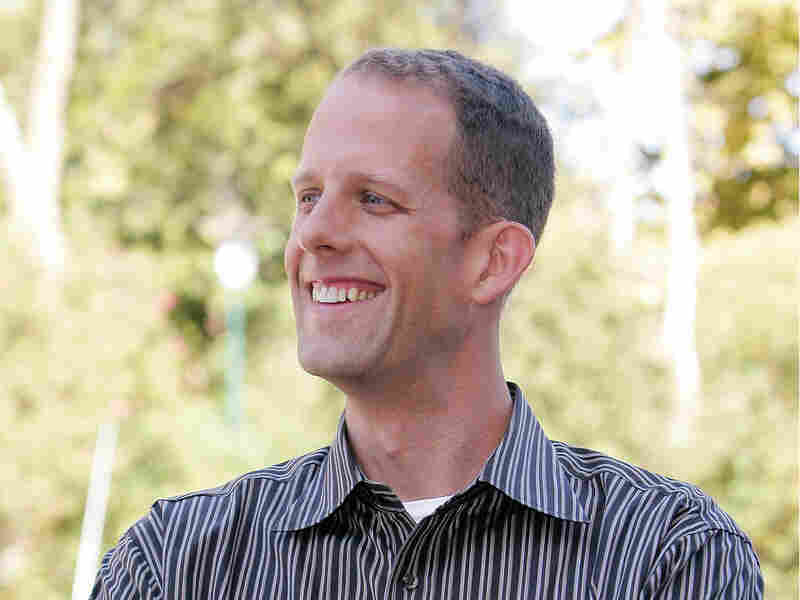 Director and screenwriter Pete Docter talks about the joys of researching and creating animated films. Script Docter: Writer-director Pete Docter co-wrote Pixar's summer hit Up and earned a story credit on 2008's enormously successful Wall-E. The animated 3-D movie Up — directed and co-written by Pixar veteran Pete Docter — became the first animated film to open the Cannes Film Festival earlier this year. 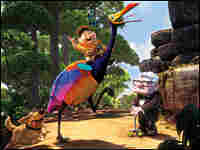 An adventure story featuring a grouchy old man, a chubby, dauntless scout, a 13-foot flightless bird and a house borne aloft by balloons, it was a buoyant summer hit for Pixar, earning ecstatic reviews and taking in more than half a billion dollars at the global box office. It's out now on DVD and Blu-ray. Docter, who directed the Pixar hit Monsters, Inc. and worked on last year's smash Wall-E, told Fresh Air host Terry Gross that the tale's influences included everything from Werner Herzog's Fitzcarraldo to the animated work of Hayao Miyazaki. Docter also confessed to doing a bit of undercover research to help flesh out the central character in Up: He and several instrumentalist colleagues — Docter plays bass, the others ukuleles — visited a retirement home as volunteer entertainers but took the opportunity to observe the tics and habits of the elderly men in residence. "And so we were playing for these guys and secretly kind of taking little notes for ourselves," Docter says. That kind of sub rosa observation is something of a habit for Docter, in fact — and invaluable for an animator. "I love to go to the airports, and just put on dark glasses so nobody can tell I'm staring at them, and just draw people," Docter says. "It's a lot of fun, and endless hours of entertainment — just watching the way people do simple things, even like eat a meal or, you know, wipe their kid's face or whatever. Just great behavior stuff." 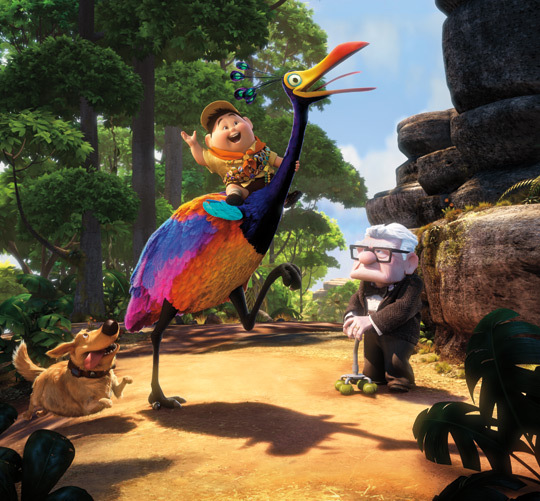 Unlikely Allies: Eight-year-old Russell, septuagenarian Carl and 13-foot-tall Kevin find themselves exploring a South American jungle together in Up-- despite Kevin's tendency to swallow Carl's walker. The film is out now on DVD and Blu-ray. Docter joined Fresh Air in May for a wide-ranging conversation about the joys of revisiting classic animated movies, about traveling to South America on the Pixar credit card to do story research, and about why he turned to the Muppets — and to the silent comedians Buster Keaton and Charlie Chaplin — to figure out how to create a range of emotions for that 13-foot bird. And he explained why Up, like other recent 3-D projects, doesn't try to use the process as a special effect. "It's ... another tool like lighting, like color, cinematography," he says. "It's just another way of furthering the emotion that we're trying to communicate to the audience. ... We tried to use it a little more like a window that you look into, as opposed to — I don't know about you, whenever I see 3-D movies, it's going booga booga booga in your face, and I'm suddenly aware, Oh, I'm sitting in the theater wearing dopey glasses, you know? So we tried to use it much more subtly." This interview was originally broadcast May 26, 2009.